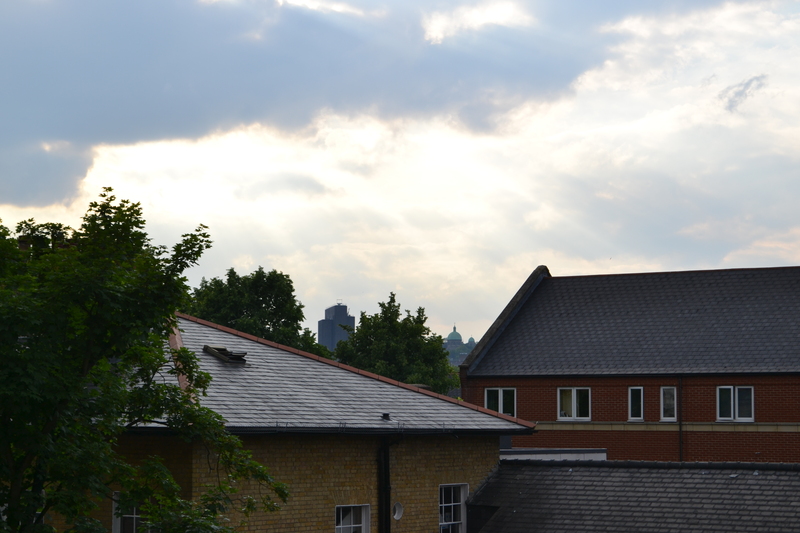 From my windows, I can see a few of London’s rooftops, and a mint green dome that reminds me of St Joseph’s Oratory in Montreal, where I grew up. Both domes have that funny quality of seeming to be visible from anywhere as long as you’re far away enough. Real geography could prove me wrong, but I have these memories of being able to pick St Joseph’s out of the rest of the downtown core from all the way in Laval, the next city over. Similarly, no matter where I am in my flat, there is that oxidized copper top, made all the more beautiful by London’s sunsets and cloud formations. 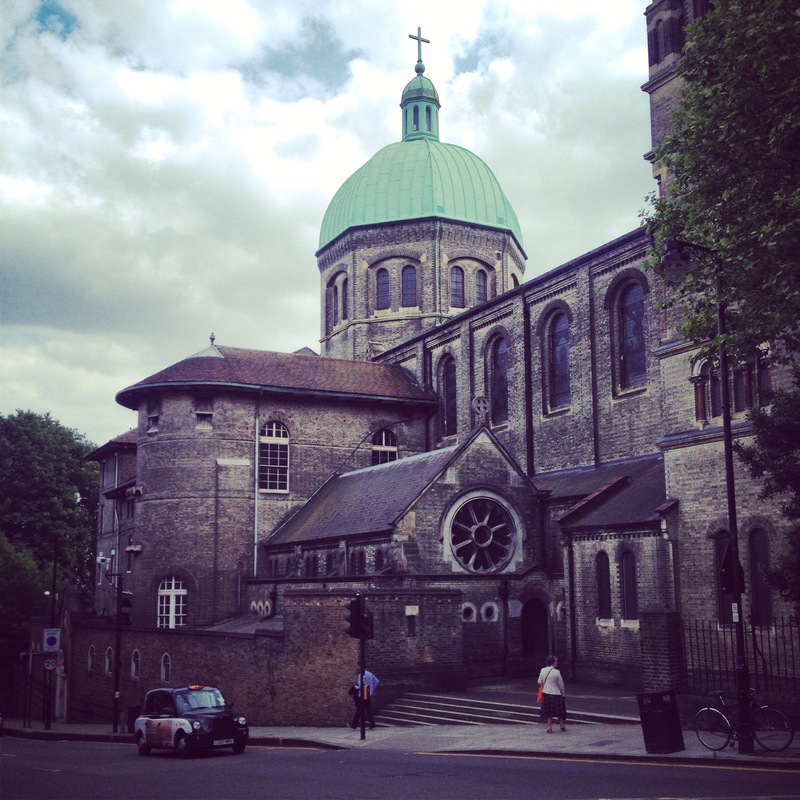 This entry was posted in Uncategorized and tagged London, St Joseph's, travel, walks on June 9, 2014 by CatherineTs. 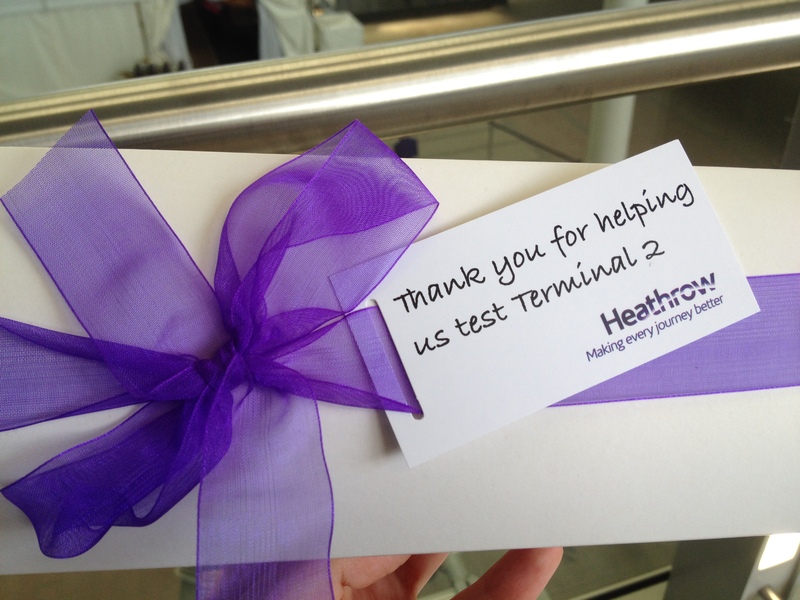 I forgave them because I wasn’t entirely sure myself how I had been convinced to reserve an entire day’s holiday for the purpose of taking part in a trial of Heathrow’s soon-to-be-unveiled Terminal 2. 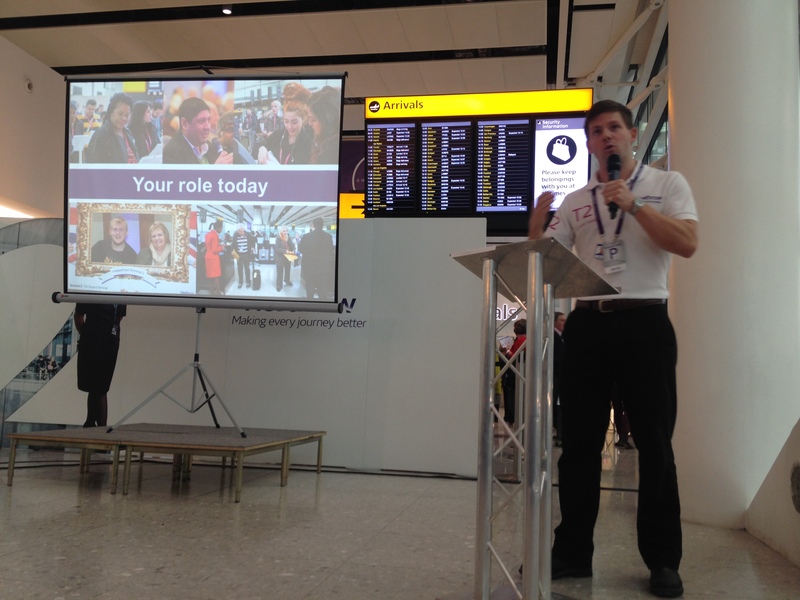 I did know it had something to do with the infectious enthusiasm of my aviation-loving significant other…and I had heard that there’d be free lunch, which probably tipped the scales a bit. 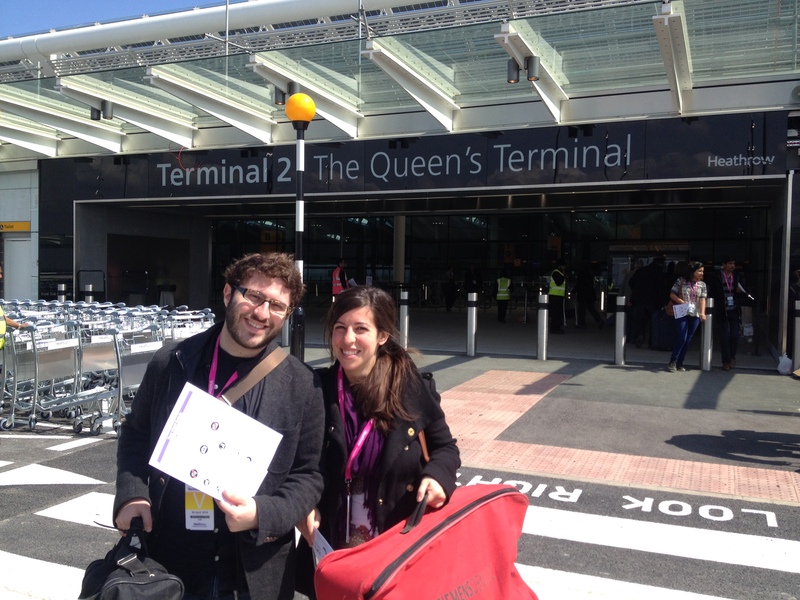 Thus it was that on the Wednesday of a 3-day tube strike we shlepped our way to Terminal 2 – the Queen’s Terminal – to simulate the departure and arrival segments of a fictional journey. The mood was festive (hilariously, given that no one was actually on their way to sunny foreign lands), and we were all given our ‘passenger scripts’. 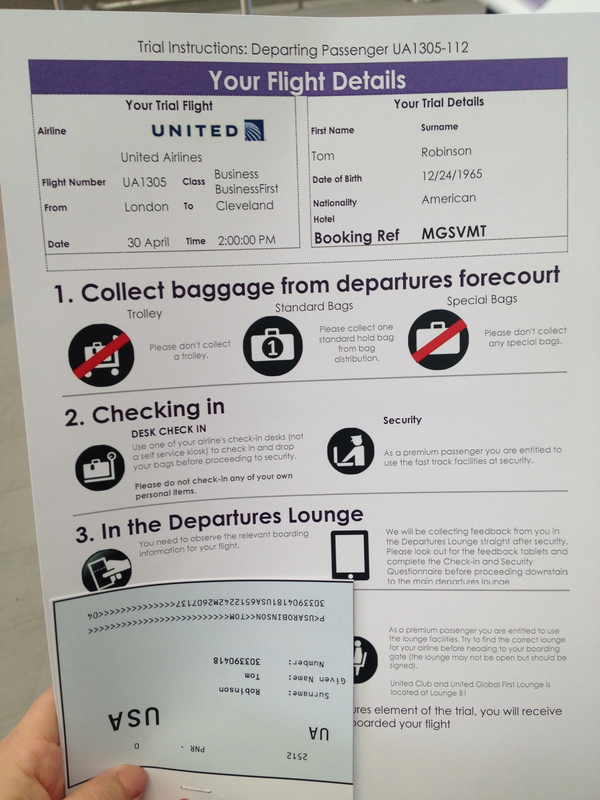 I became Tom Robinson, an American traveling to Cleveland (gender specifics didn’t seem to be a thing, leaving you free to REALLY use your imagination). I was a bit disappointed I wasn’t assigned the canoe as baggage that kept being mentioned in our introductory presentation, but the business class designation made that easy to get over. 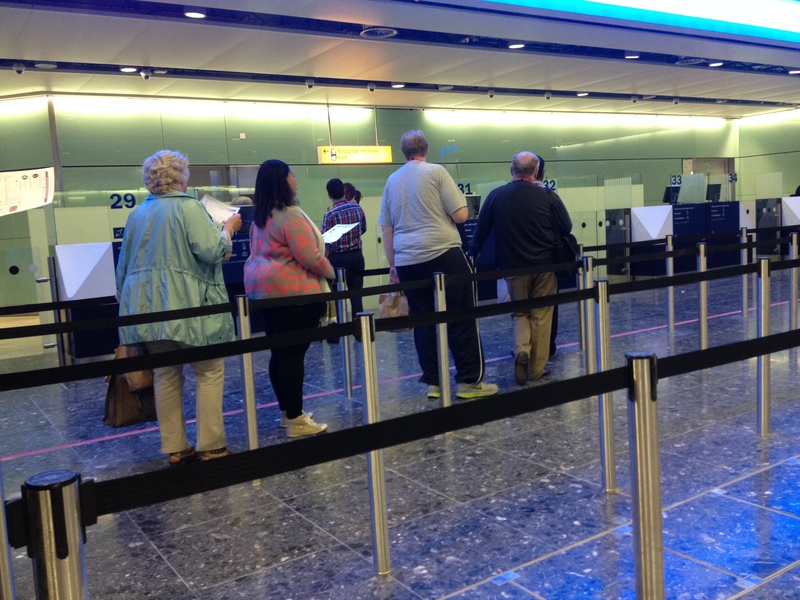 We grabbed our normal-sized luggage and made our way to business class check-in – where chaos ensued!! Several passengers very clearly missed the cut off time for bag drop (pity the guy with the canoe at that point) and it seemed like a real possibility that Tom Robinson wouldn’t make it to Cleveland. 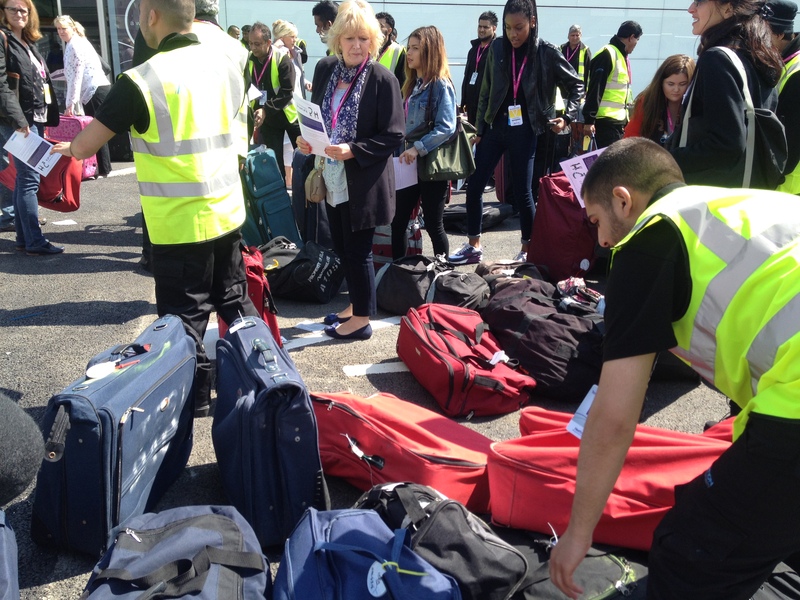 From what I could see, this had more to do with the organization of the trial than the actual airline crew checking people in, but good practice nonetheless, right?! Now, I knew all of this was fake, but this didn’t stop Mike from rushing us through the waiting area where our free bagged lunches were ready to be leisurely enjoyed. Instead of sitting down and eating while NOT MOVING like civilized folk, I was forced to grab my lunch without breaking stride and rush to security. Mike had obviously become one with his alter-traveling-ego and refused to listen to reason (ie me pointing out that we didn’t have an actual flight to catch). 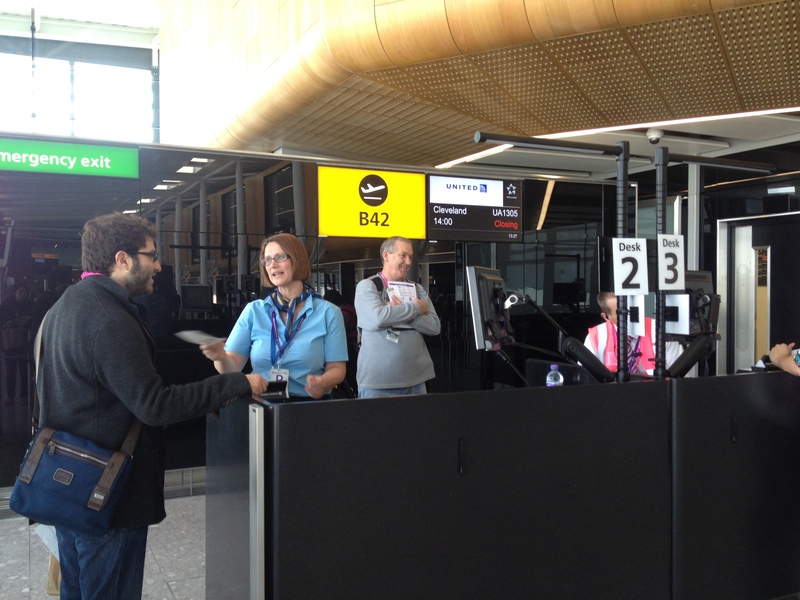 After a couple of hitches at security (again, this was more the system not being able to check volunteers’ badges as opposed to the actual security set up or anything) we ran (yes, ran – right by the free KitKat bars) to our departure gate. In real life, we probably wouldn’t have made it, but as it was A TRIAL (*cough cough*) the plane was still ‘boarding’, whew. After our safe arrival, we were asked to give feedback on one of the many ipads propped up by the exit (we should’ve done this at some point during the departures simulation but again, we had to run). All in all I was very impressed – everything was clearly sign-posted, I saw multiple washrooms and the terminal was sleek and shiny with a good flow of direction. We were sent on our way with a thank you gift, and I was finally able to tuck into my sandwich on the coach back to Victoria. 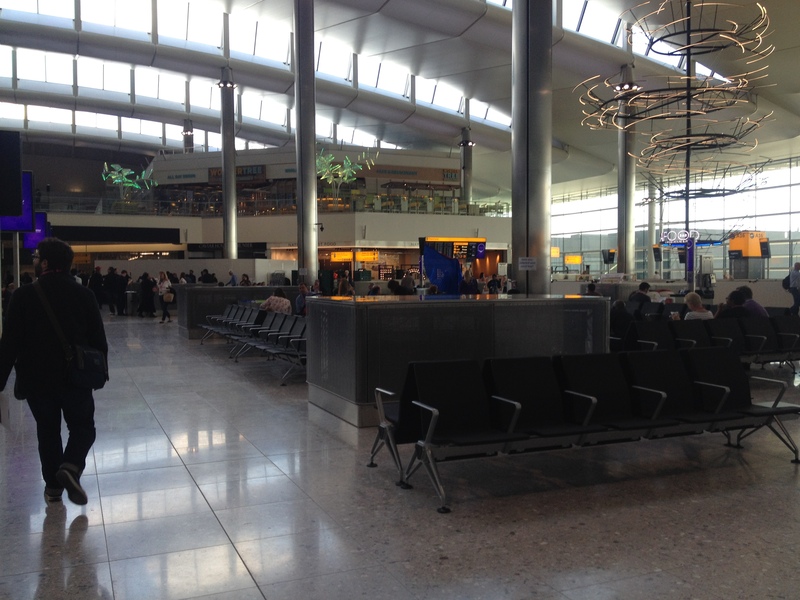 Terminal 2 opens with its soft launch this week, and will be periodically adding more airlines over the next few months. 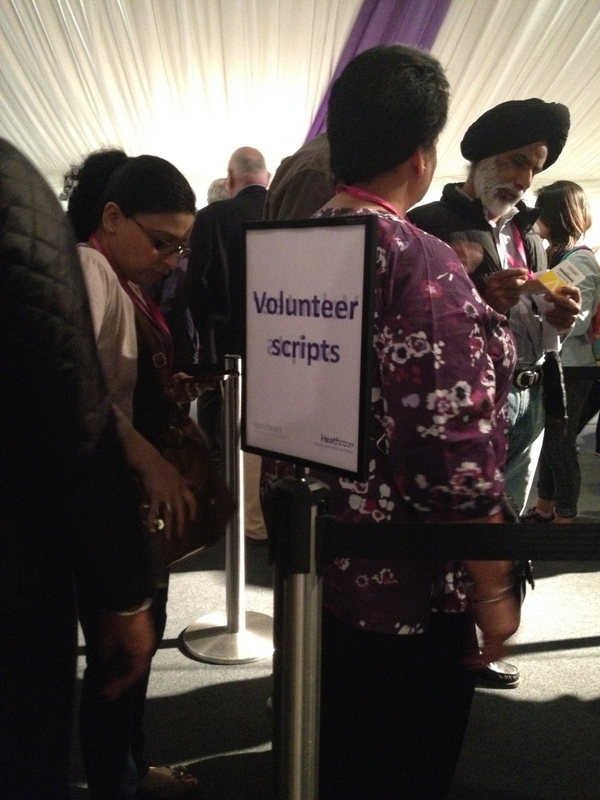 I think with all the preparation (and thousands of crazy volunteers like us!) 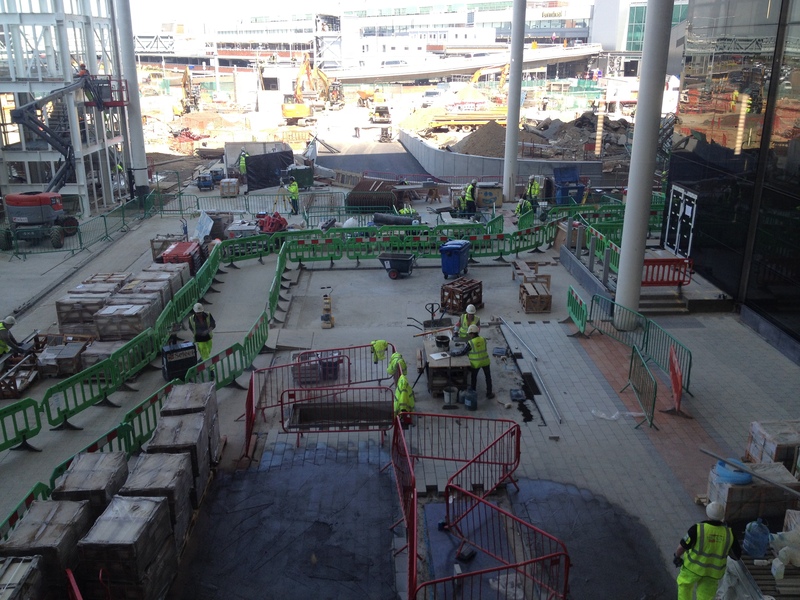 they’re looking at a smooth unveiling – but only time will tell! 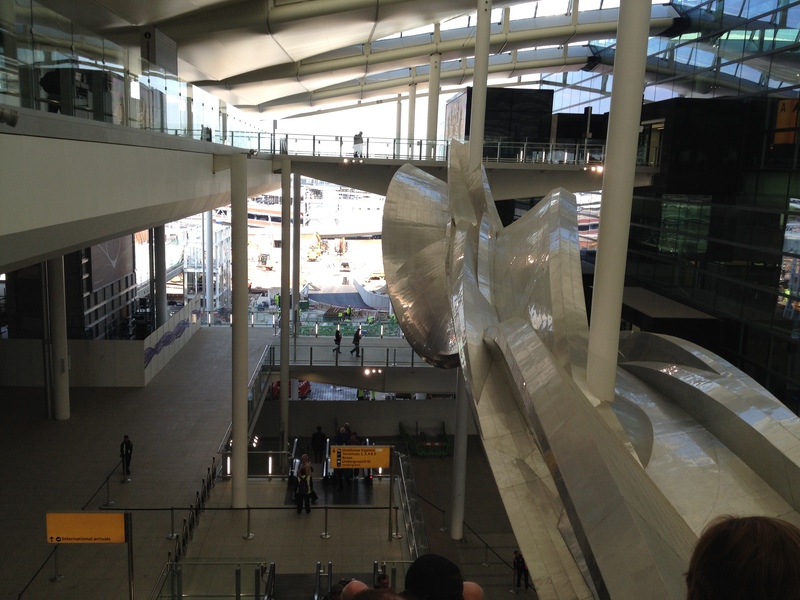 This entry was posted in Uncategorized and tagged aviation, Heathrow, London, Terminal 2, travel on June 1, 2014 by CatherineTs. 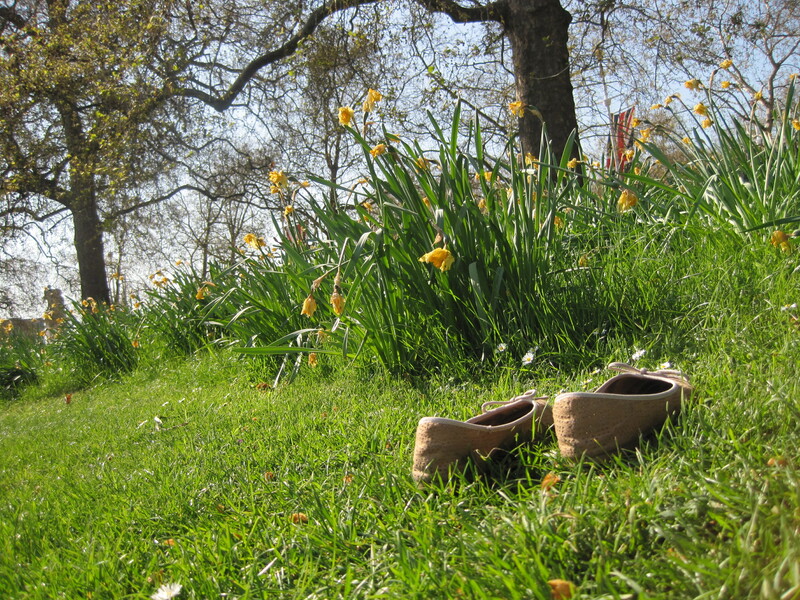 Springtime in London is a confused and wonderful beast. Time in the spring is funny in that it doesn’t move according the normal laws of chronology. Outerwear goes from wintercoat, to spring coat, to nothing, to wintercoat again in a single week. Come to think of it, in a single day! We can blame the divisive nature of London sunlight for this. Streets can encompass two seasons at once – choose left sidewalk for vitamin d and right sidewalk for shivers! This speaks to the London rule of layers (always have them). Maybe there exists a way to remain a consistent temperature throughout your entire commute but if there is, I haven’t found it. As it stands, I’ve resigned myself to chilliness when I leave the house, a growing level of discomfort as I descend into the Underground, and full-on overheating as I stand crammed into a Victoria line tube carriage. Spring in London wreaks havoc on fashion – sunglasses and parka combination here, sandals and scarves duo there. And that hay fever! You can’t tell if you’re being plagued by a sore throat or if that’s just the pollen from the plane trees doing a number on your sinuses. But then there’s that funny, dream-like time quality again. Time stretches – weekends feel longer and more full, Soho swells with after-work merrymakers. Memories blend and weave into each other, as one weekend is spent drinking prosecco on a picnic blanket in St James’s park and the next bundled up and testing out the resilience of your 11th umbrella of the year. Also, annoyingly and hilariously, spring almost always sets you up for disappointment. If March is this glorious, you think, wait til August! …then August ends up feeling pretty much the same; a wonderful weekend here, rainy stretch there. But this just means that you end up making the most of the weather when it chooses to play nice. And make sure you have your 12th-15th umbrellas on hand. 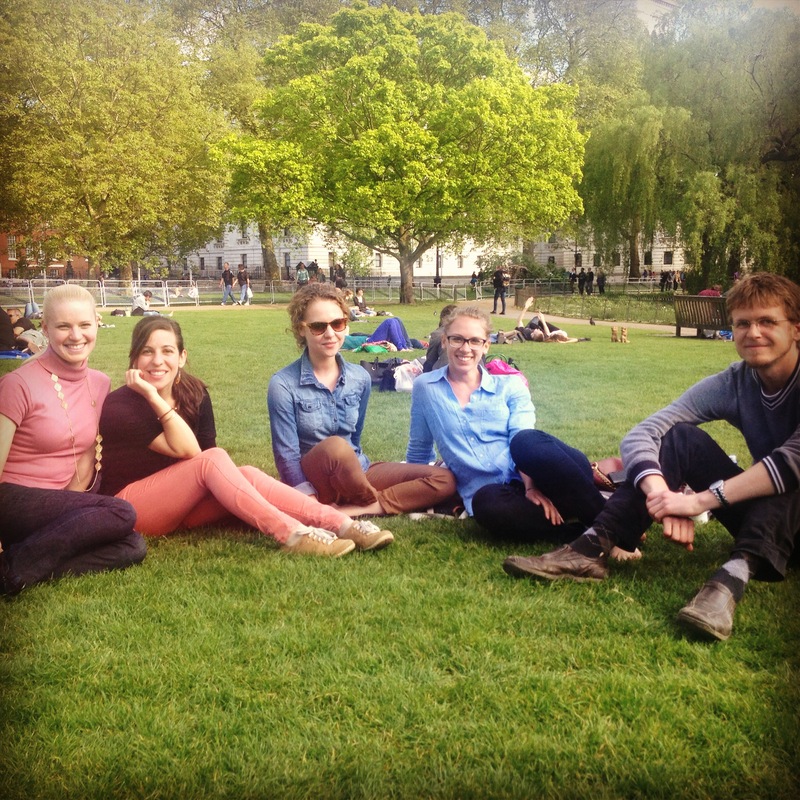 This entry was posted in Uncategorized and tagged London, spring, travel, weather on April 27, 2014 by CatherineTs. One night during my first year living in London, I gathered with a group of fellow international students in the kitchen of our graduate residence, huddled around a flickering television set that looked like it was straight out of the 1980s. It was the eve of the Vancouver 2010 Winter Olympics, and though it was past midnight, and the BBC feed fuzzy, I was determined to watch the Opening Ceremonies in their entirety. I felt it was the least I could do, to make up for being out of the country the first time in my living memory the Olympic Games were being held in Canada. Thus when my friend was going off about nationalism, I wondered. Was the sole byproduct of patriotism quick hits of smugness when your country’s star was on the upswing, alternating with pangs of homesickness? Did all this only serve to prevent you from being fully present in your current surroundings? The revelation that came to me over the next two weeks – one that has been enforced by another Olympic Games and various July 1st celebrations in Trafalgar Square – is that cheering for your country, kilometres away from friends and family, can be one of the best ways to integrate yourself into your new home while simultaneously remembering where you’re from. Being away for the Olympics makes the second largest landmass in the world smaller. When skier Alexandre Bilodeau became the first Canadian to win a gold medal on home soil, I proclaimed to any Brit who would listen that were practically neighbours (I have cousins in Rosemère and we visit them every year). I’ve never been to Vancouver, but I was bending ears for the duration of the Games, extolling its beauty and relaxed pace of life. Watching from afar also means bringing fellow travellers together. It’s quite a sight to behold, a horde of Canadians taking over a Fleet Street pub, relieved to have found the one place with a license to stay open past midnight to broadcast the hockey games. 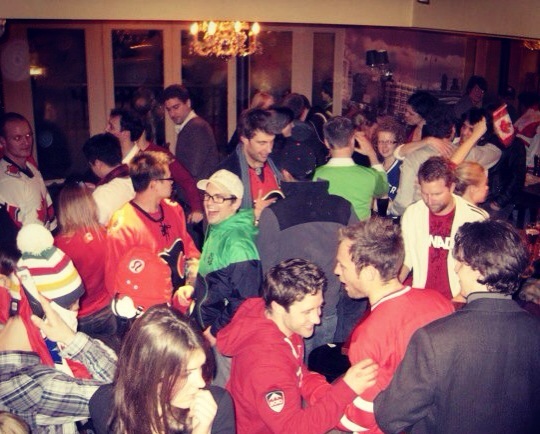 The crowd was peppered with Vancouver Canucks jerseys, Calgary Flames caps and Montreal Canadiens t-shirts – combined with a lot of flannel and quite a few toques. Canadians more resourceful than I had obtained red mittens (I’ll admit I may have co-opted a few pairs for the festivities). On top of the sporting highlights, I remember bumping into old acquaintances from the University of Toronto I had lost touch with, while strangers in matching UBC sweatshirts discovered mutual friends and reminisced about old campus haunts. All sharing stories about what brought us there in the first place: the broadening of education, a new career move, an inexorable yearning for adventure. For Canadians in London, the Winter Games remind us where we hail from and let us shed some of that national politeness to unabashedly trumpet the skills and perseverance of our athletes. We get to trade stories with our adopted hosts – the history of The Hockey Sweater for an explanation of what countries actually make up TeamGB. We are proud to be considered gracious yet fierce, with an innate ability to harness winter and churn out gold. So while I never needed a comparative experience to yell my heart out with friends and family back home, I now know what it means to be outside of my native element, surrounded by people who are proudly Canadian not just by virtue of logistics but also by choice. After Sidney Crosby’s winning goal in the men’s hockey final, I wasn’t able to witness the CN Tower lit up in a stream of gold, except via Facebook feeds and Twitter streams. 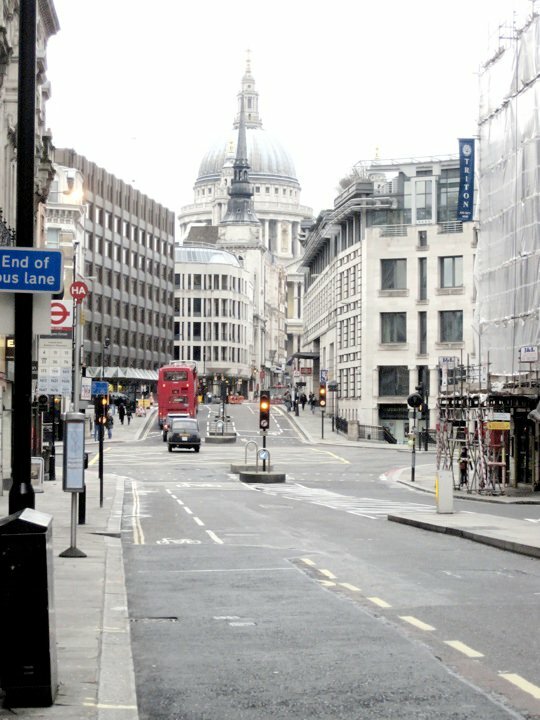 But as my compatriots and I ran out towards St Paul’s Cathedral with our flags draped around our shoulders and stopped traffic, the few British motorists left on the street rolled down their windows and tooted their horns. Not sure if they knew what we were on about, but it sure felt like home. Four years later, I’m still in London, but I’m better prepared for Sochi 2014 viewing. Reconnaissance has been done on pub opening hours, and I have quite a few flags lying about my flat. 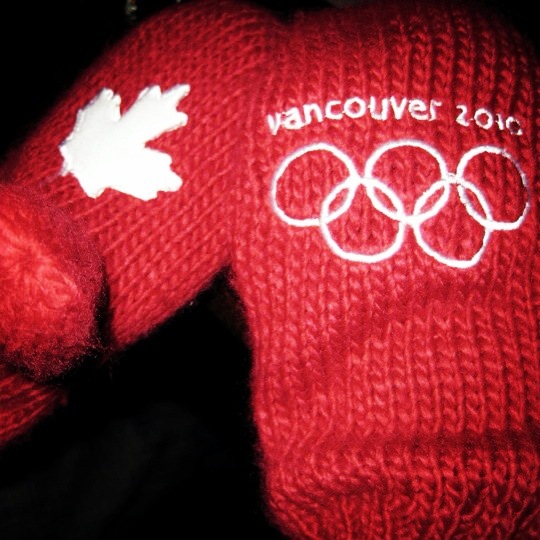 I have my own pair of red mittens, acquired over the Christmas holidays – but I won’t feel too bad if they get passed on to someone experiencing her first year away and just a little unsure of what it means to be a Canadian abroad. This entry was posted in Uncategorized and tagged Canada, London, Sochi, sports, travel, Winter Olympics on February 6, 2014 by CatherineTs. 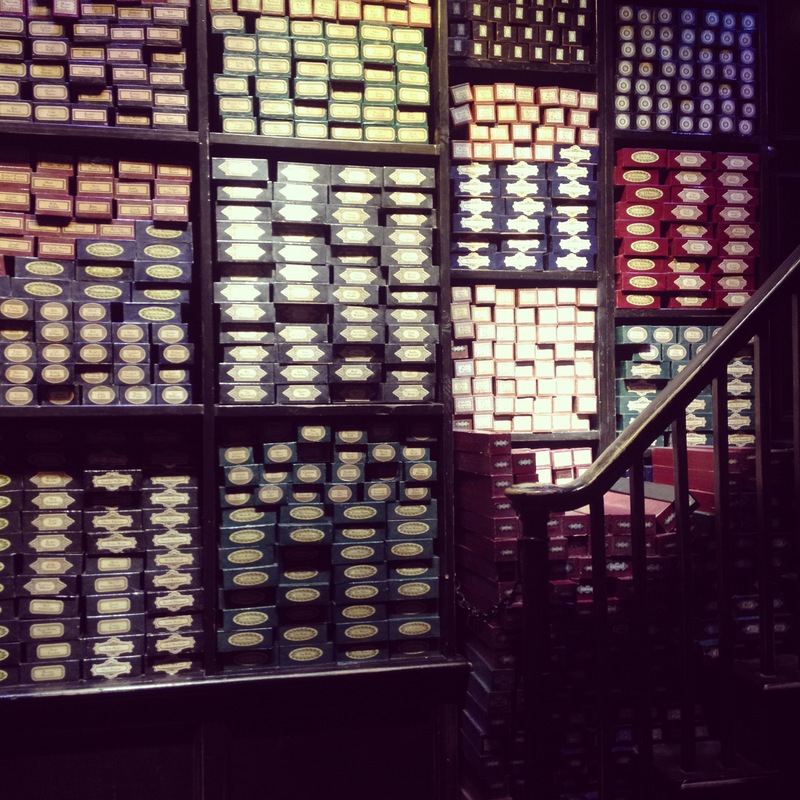 The year I did a summer exchange at the University of Oxford, there were quite a few suitcases weighed down on the way over by the final installment in J.K. Rowling’s Harry Potter series. Plowing through the Deathly Hallows on a bench outside Christ Church College – which houses the inspiration for the Great Hall in the movies – made the reading of the last book all the more emotive. A few years later, I was working a short walk from Trafalgar Square while a shrieking and exuberant crowd celebrated the premiere of the final Harry Potter film. I think that’s when it hit me, that as much as the series is a global phenomenon, it will at its heart always be a very British treasure. What a gift to give the world, everything from J.K. Rowling’s initial literary creation to the behemoth film ventures. 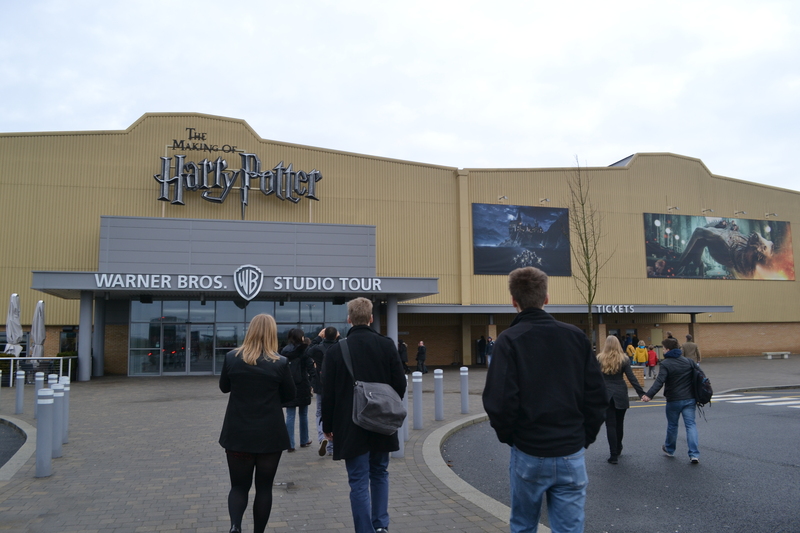 And, if that’s all not enough (which it isn’t, to any Harry fan worth their every flavored beans), there is THE WARNER BROS STUDIO in…Leavesden. Fear not, it is more accessible to those in London than it would initially appear (though judging by how fast tickets for this weekend filled up, I don’t think Warner Bros should be too worried about visitors being daunted). Whereas the Wizarding World of Harry Potter in Orlando is more of a theme park (at least, I gather it is – my entire family made the trip without me, so I wouldn’t know on a firsthand basis!! 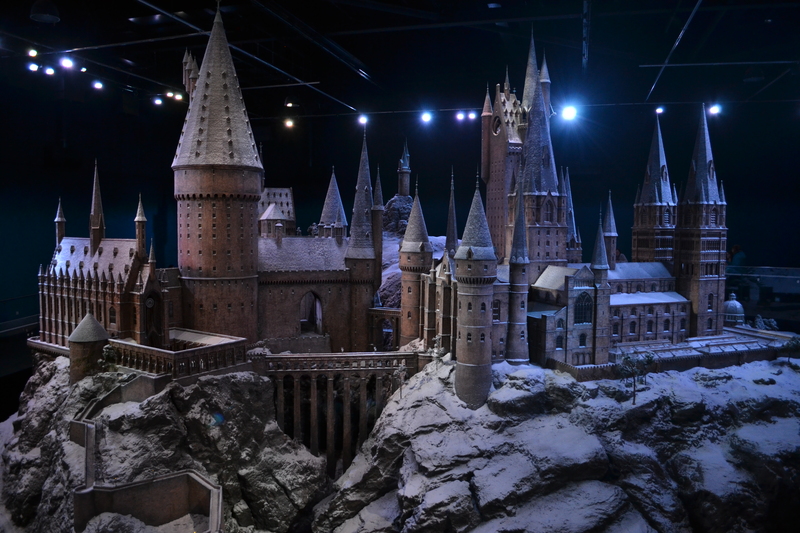 Ahem ahem), the Warner Bros Studio is where a majority of the scenes in the movies were filmed. A suggestion – if you’re like my friends and I and enjoy pointing and yelling at recognizable sets/items/costumes (AND WHO DOESN’T), watch some (or all) of the movies first to make the whole tour even more incredible. It really is a magical experience (for groups in their 20s to parents with kids dressed up as witches and wizards alike). The sheer size of the endeavor that was the creating of the films is awe-inspiring. 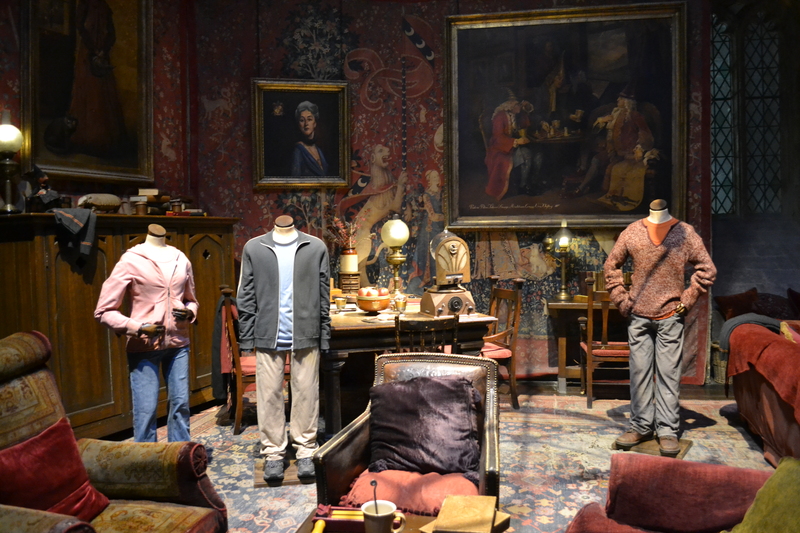 The tour opens with a recorded spiel by Daniel Radcliffe, Emma Watson and Rupert Grint, highlighting the work of countless actors, producers, directors, make up artists, costume designer, special effects teams, graphics wizards, etc etc…but the exhibits truly speak for themselves. 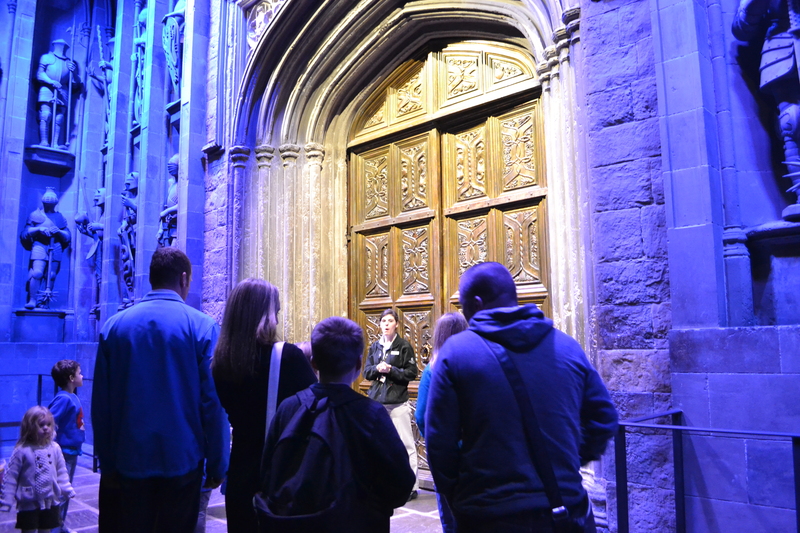 The tour opens in Hogwarts’ Great Hall, where everything looks straight out of the movies except for the ceiling, which was digitally enchanted with rain, sunshine and snow. 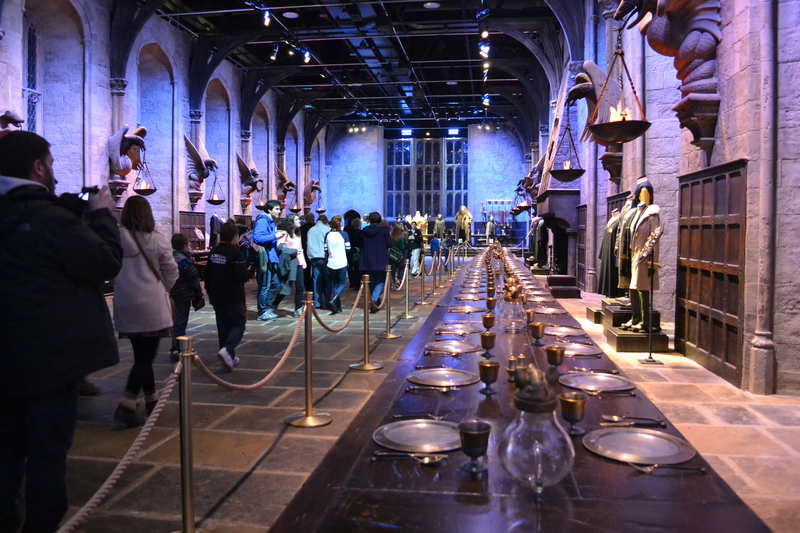 You then leave the dining hall for a feast of another kind – sets, props, costumes, and trinkets are everywhere, and you understand why they recommend 3 hours for the visit. 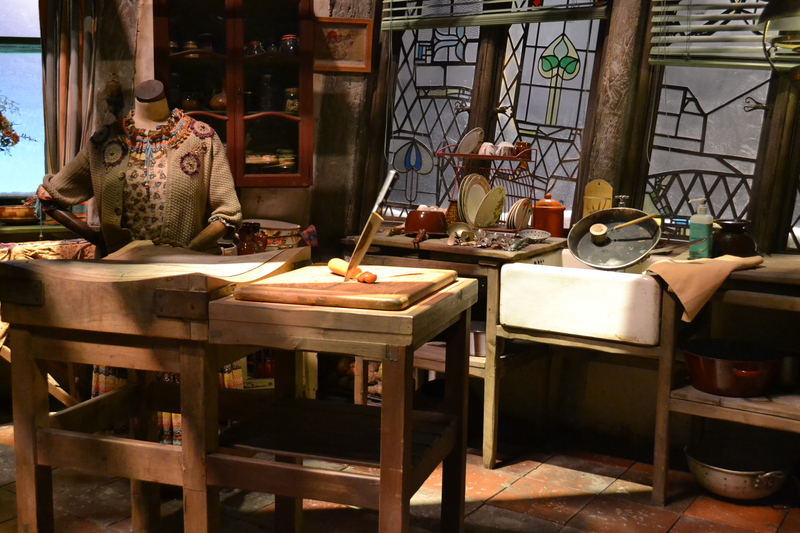 The Burrow, home of the Weasley family – note the knife and scrubber working by magic! 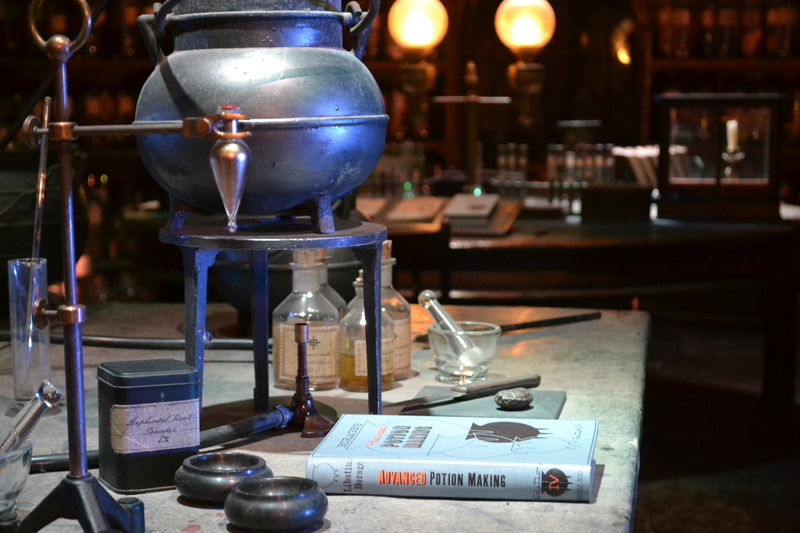 Don’t want to spoil the magic with too many photos, but it’s all there: Dumbledore’s office, Hagrid’s hut, the House of Black family tapestry, Dolores Umbridge’s terrible pink lair…not to mention Horcruxes, animal familiars and the wand of practically every character. There’s a brief outdoor bit with the flying Ford Anglia, a model of the bridge to Hogwarts and the Knight Bus (THIS IS WHERE YOU GET THE BUTTERBEER!!! Looking up homemade recipes immediately). 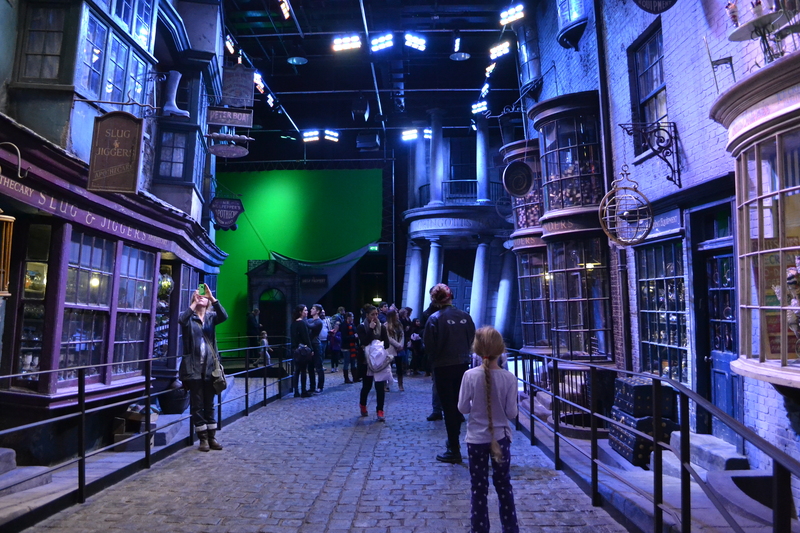 There’s also a section where you can get your picture taken on a flying broomstick, complete with a green screen sky background and a wind machine, but the only photos allowed are the professional ones you’d have to pay for. We opted to skip it, but it would definitely make a fabulous adornment for the fridge for anyone interested! There are rumors that there may be plans in the works for theme-park style additions, with rides and such. It’s totally worth the visit now though; you really won’t be able to leave without marvelling anew at the success and gloriousness of the entire franchise. More than that, you’ll have an even greater appreciation of the love and detail that went into bringing Harry and Co to the big screen…and want to read and/or watch all the books and movies again and again. Book your tickets (£30) early! A month or two in advance to be safe – I checked a couple of weeks before our slot and the entire weekend was sold out. There is a cloakroom but I was actually told they weren’t accepting coats because ‘it is VERY cold outside’ (it was 11 degrees) and there is a brief stop outdoors. To get there, you take a train from Euston Station to Watford Junction (we booked as a group of 3 and got return tickets for £6.75. Then I lost my return ticket and had to pay an additional £10. DON’T DO THAT!) 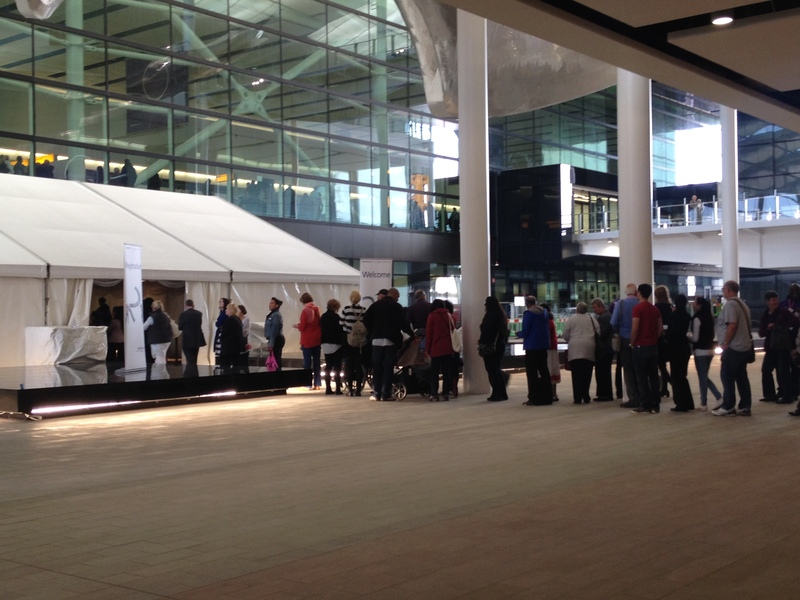 Shuttle buses (£2 return) go from Watford Junction to the studio and back. 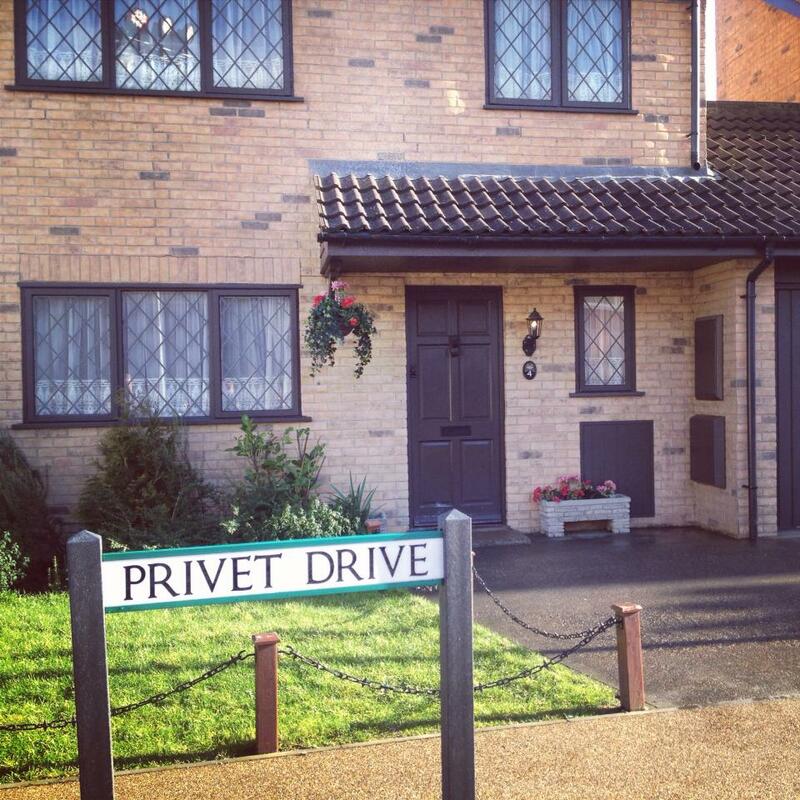 This entry was posted in Uncategorized and tagged books, Harry Potter, Hogwarts, J.K. Rowling, Leavesden, London, movies, travel, Warner Bros Studio on January 26, 2014 by CatherineTs. Anyway, I remain in awe of these fashionistas, never fearing that in this weather their feet may get so sweaty as to just pop out of their strappy sandals. Not sure if foot-watching is a thing for most people, but observing the heels clacking along in Tokyo might just make it so. This entry was posted in Uncategorized and tagged fashion, Japan, shoes, Tokyo, tourism, travel on September 8, 2013 by CatherineTs.